Apply using the form on this page. Email/message us a Photo ID. Sponsor Guarantee OR Credit / Income Verification OR International Student Visa & Proof of Enrollment. Sign the Lease AND pay the Holding/Security Deposit. 1. Apply using the form below. Most year-long leases start July 31, 2016. We may have some spaces available at other times. Your last address, or a more permanent address such as a parent's home address. Who should we contact in case of an emergency? Please include as many names and numbers, as well as their relationship to you. Please include details about both, if appropriate. Are you applying with anyone else? Please list their names. How many total bedrooms are you and your roommates looking for? Are you interested in our Roommate Matching program, where we can introduce you to possible roommates? No, I do not want Green Properties to help me find roommates. Yes, I am interested in being matched with possible roommates. I don't know. Do you want us to include the water and electricity in your rent, at the rates listed on the layout page? You can decide this later. I'm not sure yet. Yes, my roommates and I want the Utility Package. No, my roommates and I will manage our own utilities. Do you want us to furnish the apartment, at the rates listed on the layout page? You can decide this later. If you want to know more, please call us or select, "I'm not sure." I'm not sure, and would like to discuss the furniture options. Yes, I want Green Properties to furnish the whole apartment. No, I will provide my own furniture. If someone referred you, please put their name so we can thank them! Thank you! We will contact you in the next few days to continue the application process. 2. Email us a Photo ID. Please email us a copy of your Drivers License, Student ID, or International Visa. If you have a phone with a good camera, it may be easiest to photograph it and send it by email. You may also provide an ID when you visit our office. OR International Student Visa & Proof of Enrollment. The simplest way to complete your application is to have a parent/guardian fill out the Sponsor Guarantee. This form needs to be notarized by a Notary Public at any major grocery store or bank's customer service desk. Then you can mail it or bring it to our office. If you are an international student, you should email us a copy of your current valid international Visa and proof of enrollment in a local university. We can also complete your application by performing a basic credit check (with a minimum score of 700), and asking for 3 months of income history (your income should be 3 times your share of the monthly rent). Please call our office at (706) 543-8505 if you would like to go this route. 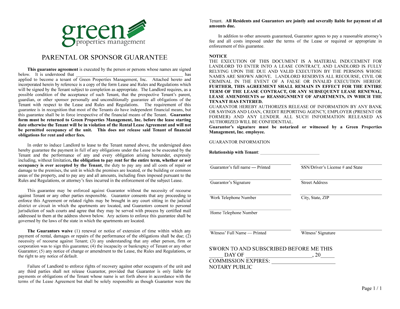 Download the Sponsor Guarantee PDF. 4. Sign the Lease AND Pay the Holding/Security Deposit. We'll send you a lease to review and sign. It's often easiest to get everyone to come into the office to sign it together, but we can also have everyone sign it by email. At the time of signing the lease, we ask that the full Holding/Security Deposit of $100/person be paid by check or money order. This commitment holds your apartment, and then becomes the fully-refundable Security Deposit, which we prefer to return in its entirety when you move out, provided you have taken good care of the apartment. Download an example lease as a PDF. 5. Follow-up Steps Before Move-In. The entire first month's rent for the apartment needs to be paid in full by your move-in date before we can give you any keys. If you are managing your own utilities, you should set them up as soon as possible. You can learn more about setting up and managing your utilities here. You can also learn about our Water & Power Option, where we manage the electricity and water for you.